Texas Shih Tzu Rescue View other Shih Tzus for adoption. Jett the little black Shih Tzu is all kinds of cute! 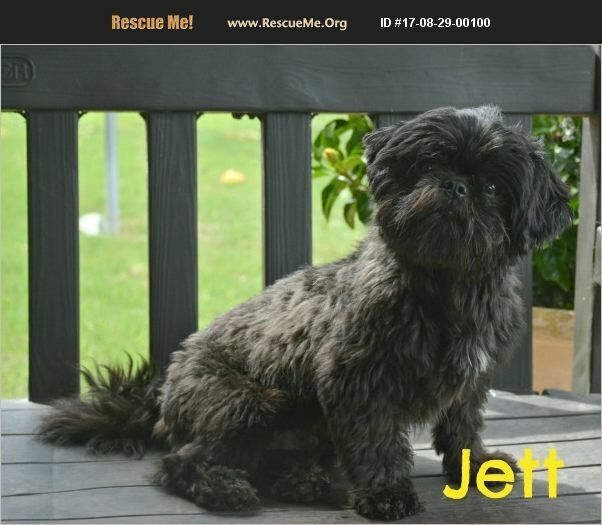 Jett came from a home with too many pets. He is a very small Shih Tzu, only weighs about six pounds and he is 4-5 years old. Jett loves people and gives great hugs. He loves to stay close and he loves to play with other small dogs - females are best because he will try to dominate another male! He went to the groomer for the first time and he didn't like it one bit so he will need a wonderful groomer that will be patient. He is a great little guy! Email us at adopt@pawedsquad.com for more information! WE ARE IN ABILENE, TEXAS where our dogs are kept in foster homes, not a shelter. All dogs have an adoption fee ranging from $100 to $400 depending on the dog. We avoid stressing our foster dogs by shipping or transporting them long distances to visit a potential adopter so please consider dogs you are willing and able to visit. NOTE: We require an application BEFORE a potential adopter will be introduced to one of our pets. We contact vets to ensure that pets already in the adoptive home are current on vaccines, heartworm prevention and sterilized. We have gotten to know the pet and our goal is to make the best match, between pet and people. PLEASE be aware, we do not adopt out to a home that has an animal which has not been spayed or neutered. We represent the pet to the best of our ability, they are rescue dogs and we don't always get their history.